$750 rebate on select new 2018 Model Year Toyota vehicles when you finance or lease through Toyota Financial Services. Plus, no payments for 90 days on select finance programs! Hurry, offer ends September 4th 2018! Congratulations college graduates! Celebrate this next step in your lives and careers with a graduation gift from Toyota. 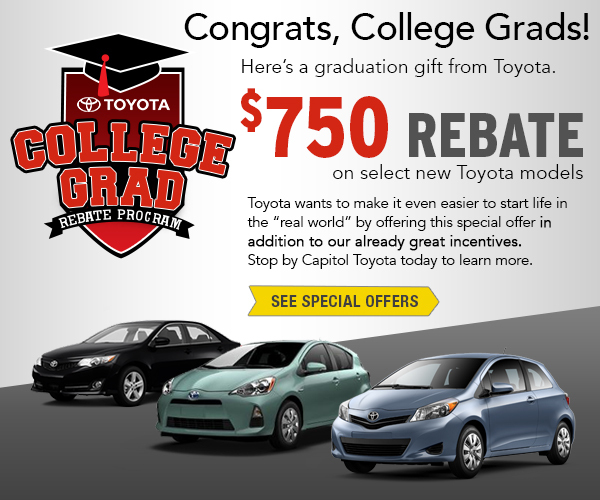 Stop by Capitol Toyota to receive a $750 rebate on select new Toyota models in addition to our already great incentives. Starting out after graduation can be daunting, that's why we recommend a capable and efficient new Toyota vehicle. At Capitol Toyota, you'll find a large selection of incredible 2018 Toyota models and certified pre-owned vehicles serving Keizer, OR and surrounding areas with the perfect model for your new life waiting. Start off in the right direction with our $750 Toyota College Grad rebate at Capitol Toyota. *College Graduate Finance Program is valid on the lease or finance (including preferred option) of select new untitled Toyota models or on Toyota Certified Used Vehicles (TCUVs) or Scion Certified Pre-Owned Vehicles. College Graduate Rebate is only available on new untitled Toyota Camry, Camry Hybrid, C-HR, Corolla, Corolla iM, Prius (excl. Prius Prime), Prius c, Prius v, RAV4, RAV4 Hybrid, Tacoma, Yaris, Yaris iA, and 86 vehicles (TCUVs and Scion Certified Pre-Owned Vehicles are not eligible for the Rebate Program). The College Graduate Rebate Program and College Graduate Finance Program are available upon credit approval from and execution of a finance or lease contract through a participating Toyota dealer and Toyota Financial Services (TFS). Not all applicants will qualify. To qualify for the College Graduate Rebate Program and College Graduate Finance Program, customers must be currently enrolled in a graduate degree program from an Eligible School (as defined below), or enrolled in or be a graduate from an Eligible School (as defined below) and provide proof of graduation (showing an upcoming graduation within six months OR a recent graduation within two years from the date of signing your vehicle lease or finance contract) from one of the following Eligible Schools located in the 50 United States, Puerto Rico, or U.S. Virgin Islands: (a) an accredited four-year college, university or registered nursing program; OR (b) an accredited two-year college associate degree or an undergraduate academic degree as awarded by community colleges, junior colleges, technical colleges and universities; OR (c) an accredited two-year trade or vocational school; OR (d) an accredited graduate school. In all cases, the student will have two years from receipt of their degree to take advantage of the program. Must provide proof of qualification and any one of the following documents will be accepted: (a) copy of diploma; OR (b) letter from the college/university/trade school registrar's office stating graduation date and type of degree or certification earned; OR (c) copy of the final transcript confirming graduation date and type of degree earned; OR (d) copy of current transcript (or letter from college/university registrar's office) confirming current enrollment in a graduate degree program. Eligible customers must also meet credit approval requirements and furnish proof of present employment or proof of future employment (which will begin within 120 days of credit approval) when submitting credit application. Rebate offered by Toyota Motor Sales, U.S.A., Inc. Rebate will be applied on TFS lease agreements toward the amount due at lease signing or delivery or capitalized cost reduction or the down payment on TFS finance contracts. Limit one rebate per lease or finance transaction. College Graduate Rebate Program is not compatible with the Toyota Military Rebate Program or iFi Program. Rebate valid on contracts executed between August 1, 2018 and September 4, 2018. College Graduate Programs are subject to change or termination at any time. Some restrictions apply. Programs are not available in AL, FL, GA, HI, NC, and SC. Rebate terms may be more generous in your local area. Ask your participating dealer about the college graduate rebate terms in your area. Competitive APRs and lease terms are available on eligible finance contracts with terms up to specified number of months for retail and lease and preferred option financing on new vehicles. See dealer for details. Must pay sales tax. Void where prohibited by law. Not redeemable for cash. ©2018 Toyota Financial Services. All rights reserved. Capitol Toyota proudly offers incredible values on Toyota vehicles, parts, and service, making us your way on the parkway in Salem. You'll find something to love in our new 2018 Toyota inventory, certified pre-owned vehicles, and new car specials. When your Toyota needs attention, take it to our state-of-the-art service center where our service specials help you save big on the maintenance you need. We also offer a full stock of genuine Toyota parts and accessories and parts savings offers. When you're ready to take the next step to driving home in a Toyota, call us or visit us at 783 Auto Group Avenue Ne, Salem, OR 97301, just a short drive from West Salem and Four Corners, Oregon. We look forward to serving you at Capitol Toyota!